Charred maize kernels were found in Feature 48, a Mississippian storage/refuse pit "cut by wall trenches of two Mississippian houses in house location occupied by sequence of four Mississippian houses" (Crane and Griffin 1966). 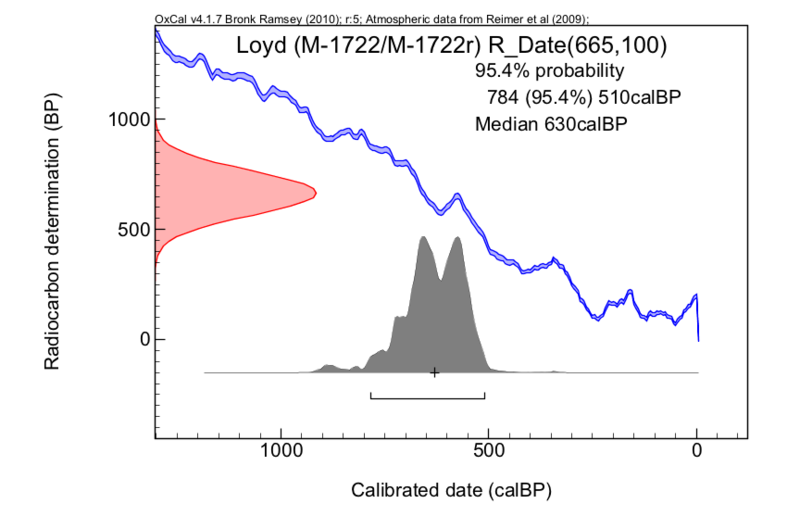 The initial radiocarbon date (M-1722) that resulted from this sample was later than expected 430 +/- 100 (Crane and Griffin 1966:267). The authors tested the possibility that isotopic fractionation in the maize had contributed to this anomalous date by submitting charred maize cob fragments from Feature 2 to check the C12/C13 ratio (Crane and Griffin 1968:79). Since this was the case, a second radiocarbon date (M-1772r) from this same maize sample was processed and the revised date of 665 +/- 100 was obtained "by adding 235 yr to previously determined B.P. age to offset the anomalous enrichment of C14 in the corn during its life" (Crane and Griffin 1968:79). For details about how this revised date was obtained please refer to Crane and Griffin (1968:79).